Nov Special 40% off Hair Removal using advanced technology to permanently reduce unwanted hair on the face and body- enjoy smooth, hair-free skin with results that last longer than traditional methods. 30% off! (save $330) Venus Versa's new TriBella™ treatment combines Photorejuvenation, Wrinkle Reduction, and Skin Resurfacing treatments in one session making it the most complete facial skin therapy. 40% off Laser Hair Removal and when you buy 3 get 10% off Micro Needling! Book now at Elenasmedispa.com! April Special 40% off Hair Removal uses advanced technology to permanently reduce unwanted hair on the face and body- enjoy smooth, hair-free skin with results that last longer than traditional methods. Our 3 Essential Winter Products for Your Skin: ZO Revitatrol Epidermal Repair. Obagi 10% Vitamin C Serum. EltaMD UV daily SPF 40 tinted sunscreen. Keep that summer glow with @janeiredale makeup, a Spa on 4th fave. Our Product of the Month is Dermalogica Canada 's Multivitamin Power Firm, a smoothing vitamin complex, which helps combat lines around the delicate eye area with vitamin A (Retinol) as antioxidant and vitamins C and E to improve elasticity! Even with all that ashy haze, sunscreen is still a must. The sun is lurking up there and your skin needs protection and product by @dermalogicacdn Protection Sport SPF 50 + Hat has you protected all summer. CONTEST TIME! Enter to win a Free Summer Solace Special - 2 x 90 min Floats and 1 x 60 min Infrared Sauna (shareable!). Genuine admiration of others & self love are never unhealthy habits. This blackberry and vanilla infusion is a cotton candy lovers dream come true. Are you team sweet or team savoury? Yes we do! #kitslife #buylocal #Repost @rightshoevan Good vibes only. Guess which soap we're pouring in Lush Manufacturing today? Comment with your guesses. Hint - it's made with cooling peppermint oil - perfect for these hot summer days. Did you know...Water therapy has long been a favourite method of healing and spiritual sanctuary. Happy Fourth of July! Here's to life, liberty and the pursuit of happiness (and great hair). This blackberry and vanilla concoction will lift your mood all the way up. Like if you're a fan of The Comforter Shower Cream! Welcome new staff! This week we are welcoming two new fabulous additions to our team. Welcome, Michael and Sunny! These small bars have huge potential! 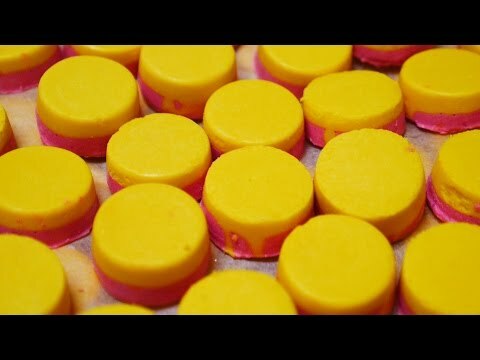 One shampoo bar will last up to 80 washes—that’s the equivalent of two or three bottles of liquid shampoo! Big, beachy hair... yes please! Big beachy hair all year... yes please! Big Solid Conditioner is packed with sea salt for volume and lightly hydrating coconut oil to condition hair without weighing it down. Superdad Bath Bomb's sandalwood and olibanum oils release a woody, earthy scent the moment it starts to fizz. Tag a dad who deserves a Superdad bath! Who Doesn't love free stuff?! You get a FREE service when you sign up for one of our HÄLSA club options. We've infused Sugar Scrub with calming lavender and stimulating ginger and fennel to soothe your nerves and invigorate the skin. More gorgeous tootsies! Come into the spa and let us add some glamour to your toes. What is the Theta State in Flotation Therapy? Once you begin to relax, it is likely you will drift in and out of theta brainwave state, that beautiful relaxing twilight state between wake and sleep. Today's the day! Here's the deal folks: You absolutely must eat and must be hydrated. Summer's almost here, and that means skin protection is a must. Take time for yourself, clear your mind. Less stress, Less mess. LIKE if you agree! Who's excited? Tag your piercing buddy in the comments below! It’s time for our Get #nakedwithlush Challenge! Follow us on our social channels, share a photo of you using one of our naked products and tell us about why you decided to get #nakedwithlush. Permanent addition to our Granville location, originally from Spain. Starting May 2017. Over 35% of our products are totally packaging-free, or as we like to call them, Naked. Boom! Toothy Tabs are back in stock! These little tabs are packed with powdered charcoal, gunpowder tea, black pepper oil and ground chili to keep your smile shining bright. Restorative, peaceful, mind expanding. Develop strength and focus....Float. Death Penalty Focus is a partner of our Charity Pot program working to end the death penalty. They're using education, grassroots organizing and political advocacy to #HaltAllExecutions. Happy long weekend, HÄLSA Tribe. Rise and grind my lovelies! Enjoy the beautiful sunny long weekend!! Add your voice to the 90 million Americans who want to #HaltAllExecutions and abolish the death penalty. Wednesday wisdom. Looking to relax and be still? Book in with us for a soothing facial, massage or Vichy Shower. Beata - RMT Candidate Beata Konieczka has been practicing massage for the last 12 years. Happy Mother's Day! Thank you to all the moms and daughters who came in our busiest day of the year!! Happy Mother's Day! Thanks to all the amazing moms who go above and beyond every day of the year. Share this with a mom you love. Happy Star Wars Day!!! Our sale begins today: 20% off of all Star Wars merch. Momma special!! Celebrate a special day with your mom, grandmothers and daughters in one of the best way possible. Happy long weekend folks! Just so you know we are open with our regular hours as usual, 10am-12pm on Friday and Saturday, 10am-9pm Sunday, and 10am-10pm Monday! We are open Easter long weekend! Reach ultimate #bathgoals with Elsie the Giraffe, the triple citrus reusable bubble bar. It's a small sign... to book a spa visit! Life's too short to have bad hair days!! Walk-ins Welcome.